To Chop or Not to Chop, that is the question? I recently read one of my favorite designer’s feature in the current Southern Living magazine entitled, “How do I arrange the pillows on my sofa?” I was a little shocked when Phoebe Howard wrote that she does not suggest chopping the pillows. Wow! I have done the karate chop for years. Is it passé? Am I out of style? Then I saw a recent blogger’s friend blog, Savvy Southern Style, and Kim posed the same question. 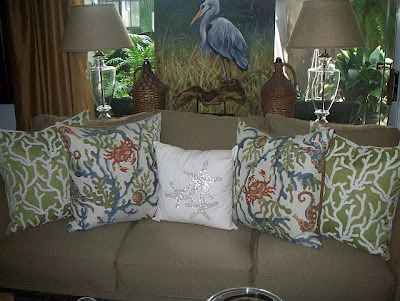 I really like my four newest coastal-inspired pillows by D.V. Kap Home purchased at Chic Chateau. I still prefer the chop on my pillows, but what do you think? Comment below and let me know your thoughts. I am blogging now because I’ll be advising my Science Olympiad team at Southeastern Louisiana University in Hammond to compete in the State competition tomorrow. It will be a long day. Wish us luck. Geaux team! Heeey Ron! I've done some research for you today (reading the new Veranda at the dock)... and I think just a slight chop. I'm not ready to do away with the chop totally, but I think it should just be very slight... like the down pillow has just fallen in place like that. 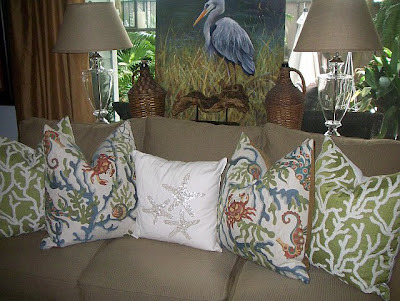 love your pillows, dislike the chop. Hope your Science Olympiad competition went well! The chop looks good. 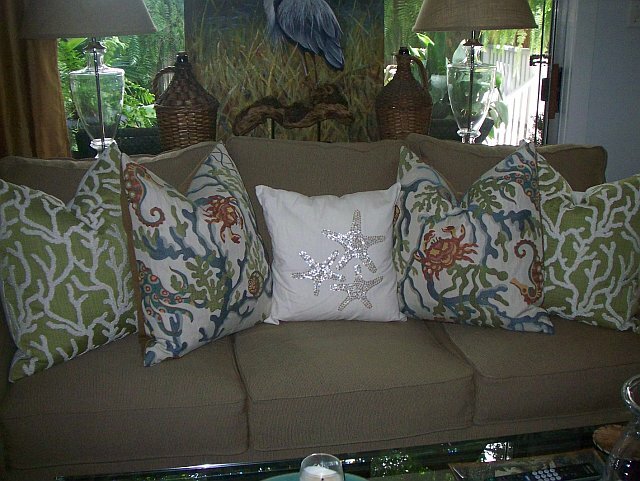 Love the new pillows. Thanks, y'all. I may have to do the slight chop!